Bruce_Hornsby_Live : Hi, I’m glad to be here. I haven’t done this very often, but I plan to do this more often in the future. DishDiva : __28Bruce, let’s talk about the new box set, “Here Come the Noise Makers.” What can your fans expect? Bruce_Hornsby_Live : You can expect a really acurate representation of what we sound like live. It’s a true picture of our live experience. That’s why we made it a 2 CD set. We wanted to have enough time to show the full range of what we do on a given night. DishDiva : _Joshua_PA Says: Bruce, how are you tonight…I just wanted to say that your music has really inspired my style of piano playing…who were your musical influences? DishDiva : To ask tonight’s guest a question, whisper your question just once to Ask_Questions and your question will be added to the queue. We receive thousands of questions during an event, so please keep your questions limited to one. Make it creative and short and you may get your question asked! DishDiva : _bubbaham1 Says: How large of a tour are you planning to do to support this album? Bruce_Hornsby_Live : August, they will all be around the record, just sort of spread out. DishDiva : _BHfan says: Bruce where are you tonight? Bruce_Hornsby_Live : I’m talking to you from my library room in my house. DishDiva : _ls1ss says: Which of your pieces do you find most challenging to play? Bruce_Hornsby_Live : That’s a good question! Probably the really fast ones because they are difficult technically and the slow ones because they present more of a problem of control, playing a slow rythmic tempo, which is difficult, at least for me. Bruce_Hornsby_Live : So songs like “King of the Hill” fast songs, really challenging, but fun! Trying to pull it off precicely and also creatively, meaning finding new ways to play it. DishDiva : _HornsbyFan Says: How did it come about for you to work with Spike Lee and Bamboozled? Bruce_Hornsby_Live : I think I know HornsbyFan, is that Joe? Bruce_Hornsby_Live : Spike Lee is an old friend of mine. We’ve been working together for years. He directed a video for “Harbor Lights”, “Swing Street” and Chaka Khan for “Clockers.” And he called me and asked me to write a song for his movie. I wrote for the character Delacroix. So it’s a long standing relationship. DishDiva : _chopin_03 Says: i was wondering if could ask if there is anywhere to find the piano intro to the song “harbor lights” from the album by the same name. Bruce_Hornsby_Live : It’s very easily found – it’s in the Brue Hornsby “Anthology” a rather thick sheet music available from Warner Brothers that has all the music from the first 4 albums. It’s very correct, because I checked it. It should sound just like the record. DishDiva : _StrangerthanU1 Says: Will there be another Further Festival? Bruce_Hornsby_Live : Most likely, but you never know. Bruce_Hornsby_Live : The other ones are playing New Year’s Eve in Oakland and somewhere December 30th. DishDiva : _harlygal Says: I live in the “goldmine” valley of country and western singers, all from this small valley, wondered what inspired your song “mandolin rain”, the mandolin is a common instrument here. Bruce_Hornsby_Live : You’d have to ask my brother, he wrote the words. (laugh) I wouldn’t want to speak for him. Bruce_Hornsby_Live : I think it’s about my brother who secretly had a crush on Marilyn Monroe. Bruce_Hornsby_Live : I welcome Harlygal to this discussion, I don’t think I have too many Harly Gals joining us, so we’re glad you are here. DishDiva : hornsbyfan1 says: Was it hard choosing the music for this CD set? Bruce_Hornsby_Live : Yes, it was. There were a lot of good performances to choose from. In the end it’s just a gut feeling based on several stylistic varieties in the music; wanting to represent all the periods of my music from the first record on through the 6th. And three in the end, find performances that were both creative but true enough to the song. DishDiva : DougVaBch Says: Is there a video available of your performance on PBS? Bruce_Hornsby_Live : I’m not sure exactly which performance Doug is talking about, but if he’s talking about the 1995 special, it’s not available commercially. But I’m sure you can bribe someone at PBS to make you a copy. DishDiva : Guest_MrCharlie Says: Hey Bruce: I’m on the road in Virginia Beach, staying not far from the site of the infamous “Cave” (I think it’s now called “The Roxx”). Can you share your story about the new album’s title? Bruce_Hornsby_Live : The new album’s title “Here Comes the Noise Makers” comes from a phrase that was derisively hissed by our band nightly by this regular that sat at the bar and gave us this greeting nightly. He was not a fan of our band, we didn’t play enough Skynyrd for him. (laugh) So he would jokingly say this to us as we came into the club to play our gig. DishDiva : Bruce, D.O would like you to know she is here. 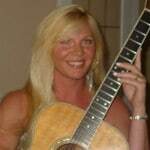 DishDiva : Hornsbyhead2 says: Will you be doing another New Years Eve concert in W’burg? Bruce_Hornsby_Live : I’m playing with the group The Other Ones at Oakland colleseum. George Clinton is playing before us. Bruce_Hornsby_Live : It’s been 10 years since I’ve played New Year’s with these guys, 1990 in the colleseum with The Grateful Dead, so it should be a very enjoyable evening! DishDiva : Sharon999 Says: Bruce, you are perfect with The other ones. How does it feel playing with the boys again? Bruce_Hornsby_Live : I’ve always loved playing with Billy, Bobby and Vic. Great on stage and great people also. 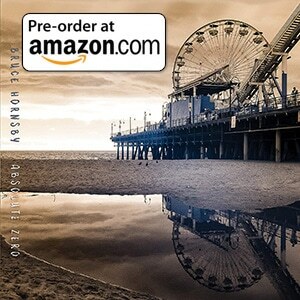 Bruce_Hornsby_Live : Absolutely! The other night we played in New York someone sent up 8 songs and I played 5 of them. So you never know, it may be your night. Bruce_Hornsby_Live : I started playing at age 17 Junior year in high school and just started playing by myself. I did take some lessons and then went to school and had Vince Naggio, a great teacher. I got so much from him when I was at school. DishDiva : rayb27 Says: I particularly have enjoyed your shows with Bela Fleck. Will there ever be an album or any extensive work with just him? Because you two are AMAZING together! DishDiva : Stazide Says: Hi, Bruce. Do you have a favorite Bruce Hornsby Song? In other words, what song is on “repeat” on your CD player? DishDiva : Lynne0407 Says: I saw you quite a few years ago at the Open Air Theatre at San Diego State University…a wonderful concert in a small setting. Do you have a preference for the type of venue you play? Bruce_Hornsby_Live : I prefer the small halls with 1,000 to 3,000 seats because being I feel inadequate being an acoustic musician. The larger venues in the back it sounds so soft, so I prefer the smaller venues. DishDiva : HighSeas_62 Says: Being and avid boater I truely enjoy and am touched by Harbor Lights. What waterways/bodies of water were your inspiration for that album? Bruce_Hornsby_Live : I wrote it about this friend of mine that was always bragging about his romantic exploits that occured at the Jamestown Yacht Basin in my home town that is on creek that leads to the James river, so I would have to say the big muddy James River. We were all so jealous of him so I thought I would write this song in tribute of his great prowess. DishDiva : Here is an interesting question. . .harlygal Says: we really would like to know your shoe size? Bruce_Hornsby_Live : My shoe size is 12 and you know what they say about people with big feet. DishDiva : Joshua_PA Says: I have heard rumors that you are related to Huey Lewis. Is there any truth to this? Bruce_Hornsby_Live : Huey Lewis married my mother’s mother making him my grandfather. I call him Grandpa Lou Bob. DishDiva : Megehe Says: on your first album..some of the songs set a Navy scene..could you expand a little on why that is? Bruce_Hornsby_Live : I grew up in an area with a massive military pressence. So we were screaming for free bird and layla. So this influence, memory, crept into my song. Bruce_Hornsby_Live : There’s actually a song with a military theme on my last record called “Fortunate Son.” It’s also on the live version. Bruce_Hornsby_Live : If you want to know what I looked like at Berklee, you can see it in the “Spirit Trail” there’s a picture of me inside and it’s my Berklee I.D. it looks like I had a lobotomy. It’s the CD with my Uncle Charles on the cover. DishDiva : Guest_Julie Says: Bruce, thanks for leading me to some great books…Lee Smith novels and Fortunate Son particularly…what are you reading these days? Bruce_Hornsby_Live : I’m reading the book “Juneteenth” by Ralph Ellison. Bruce_Hornsby_Live : And I just read the latest Tom Wolfe novel “A Man in Full.” And before that I read “Bird Lives” the classic biography of Charlie Parker. DishDiva : humboom Says: Bruce..Song C and D….in keys other than their titles. Is there a Song A and B? Bruce_Hornsby_Live : Rather than giving my instrumental pieces names like “Celtic Soltice” or “Winter Karmic Flood” I choose to sidestep the issue by naming them with letters. So there is A,B,C,D and maybe on the next record there will probably be E and maybe even F.
DishDiva : nevcab1 Says: I’d like to know if Bruce plans to work with the other ones in the future..also, any new other ones cds on the horizon? Bruce_Hornsby_Live : Like I’ve said before, we’re playing New Year’s Eve and probably the day before in California. And we are planning a new CD that we will be working on. A live CD from the tour we just did. I just had a long conversation with Micky today about that. Bruce_Hornsby_Live : I’m part of a literature conference with Lee Smith. At Baylor University in Wako Texas. I’ll be appearing at a litterary conference with Lee Smith, who’s work I love. DishDiva : Bruce, thanks for visiting us here on MSN Live! Bruce_Hornsby_Live : I’ll do it again soon!! Bruce_Hornsby_Live : It’s been great being here. Anyone who lives in the Anaheim area, I urge you to go to Orange Lutheran Baseball high school games. MSNLive_Bot : The preceding is 2000 MSN Live Thanks to our guest, hosts and to everyone that came to today’s chat! Please remember that due to the number of questions received, it was not possible for our guest to answer each one individually. Thanks for coming to MSNLive! DishDiva : Thank you to Bruce Hornsby for being our guest tonight! The chat’s topic has changed to: ..where the stars come to chat on MSN.com! DishDiva : and thank you to the MSN Live Crew for a great event! Dish Host_Bea_LiveEvents : that was pretty good……hope you all enjoyed it…..
Host_Bea_LiveEvents : Thanks Dish it was really a great show. Bruce_Hornsby_Live : Hi, I’m glad to be here. I haven’t done this very often, but I plan to do this more often in the future.DishDiva : __28Bruce, let’s talk about the new box set, “Here Come the Noise Makers.” What can your fans expect? Bruce_Hornsby_Live : You can expect a really acurate representation of what we sound like live. It’s a true picture of our live experience. That’s why we made it a 2 CD set. We wanted to have enough time to show the full range of what we do on a given night.DishDiva : _Joshua_PA Says: Bruce, how are you tonight…I just wanted to say that your music has really inspired my style of piano playing…who were your musical influences? Bruce_Hornsby_Live : Hi Joshua! Don’t copy me, but find your own style. The standard progression is that you do emulate your influences, so you imitate and then you innvovate. So you spend your time at first emulating the people that inspire you and then you find your own voice. Elton John, Leon Russell inspired me. Then I got a little restless harmonically and got into jazz with Bill Evans, Keith Everett, Herbie Hancock, Wynton Kelly, and Check Corea, etc…DishDiva : To ask tonight’s guest a question, whisper your question just once to Ask_Questions and your question will be added to the queue. We receive thousands of questions during an event, so please keep your questions limited to one. Make it creative and short and you may get your question asked! Bruce_Hornsby_Live : August, they will all be around the record, just sort of spread out.DishDiva : _BHfan says: Bruce where are you tonight? Bruce_Hornsby_Live : Williamsburg, VA.DishDiva : _ls1ss says: Which of your pieces do you find most challenging to play? DishDiva : _chopin_03 Says: i was wondering if could ask if there is anywhere to find the piano intro to the song “harbor lights” from the album by the same name. Bruce_Hornsby_Live : It’s very easily found – it’s in the Brue Hornsby “Anthology” a rather thick sheet music available from Warner Brothers that has all the music from the first 4 albums. It’s very correct, because I checked it. It should sound just like the record. DishDiva : hornsbyfan1 says: Was it hard choosing the music for this CD set? DishDiva : DougVaBch Says: Is there a video available of your performance on PBS? DishDiva : Guest_MrCharlie Says: Hey Bruce: I’m on the road in Virginia Beach, staying not far from the site of the infamous “Cave” (I think it’s now called “The Roxx”). Can you share your story about the new album’s title? Bruce_Hornsby_Live : The new album’s title “Here Comes the Noise Makers” comes from a phrase that was derisively hissed by our band nightly by this regular that sat at the bar and gave us this greeting nightly. He was not a fan of our band, we didn’t play enough Skynyrd for him. (laugh) So he would jokingly say this to us as we came into the club to play our gig. DishDiva : Bruce, D.O would like you to know she is here. 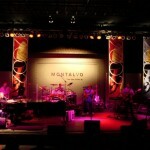 DishDiva : Hornsbyhead2 says: Will you be doing another New Years Eve concert in W’burg? Bruce_Hornsby_Live : I’m playing with the group The Other Ones at Oakland colleseum. George Clinton is playing before us. Bruce_Hornsby_Live : It’s been 10 years since I’ve played New Year’s with these guys, 1990 in the colleseum with The Grateful Dead, so it should be a very enjoyable evening! DishDiva : Sharon999 Says: Bruce, you are perfect with The other ones. How does it feel playing with the boys again? Bruce_Hornsby_Live : I started playing at age 17 Junior year in high school and just started playing by myself. I did take some lessons and then went to school and had Vince Naggio, a great teacher. I got so much from him when I was at school. DishDiva : rayb27 Says: I particularly have enjoyed your shows with Bela Fleck. Will there ever be an album or any extensive work with just him? Because you two are AMAZING together! Bruce_Hornsby_Live : Rayb, we recorded the concerts we played last summer in New England and at some point I need to go listen to them because there’s got to be a great live album in them. There are now 4 banjo concerts on tapes. Bela is great to play with and we will always play together, I just hate it when he tries to lick my ear. (laugh) DishDiva : Stazide Says: Hi, Bruce. Do you have a favorite Bruce Hornsby Song? In other words, what song is on “repeat” on your CD player? Bruce_Hornsby_Live : I don’t have a favorite song, I usually have a favorite song from each record, but I don’t have a favorite song that stands out above the rest. We’ve mixed some albums, the ballad side of our music and there are some great “I will Walk With You.” So I guess we have enough to have a new record called “Here Comes the Schlockmeisters.” DishDiva : Lynne0407 Says: I saw you quite a few years ago at the Open Air Theatre at San Diego State University…a wonderful concert in a small setting. Do you have a preference for the type of venue you play? Bruce_Hornsby_Live : I prefer the small halls with 1,000 to 3,000 seats because being I feel inadequate being an acoustic musician. The larger venues in the back it sounds so soft, so I prefer the smaller venues. DishDiva : HighSeas_62 Says: Being and avid boater I truely enjoy and am touched by Harbor Lights. What waterways/bodies of water were your inspiration for that album? Bruce_Hornsby_Live : I wrote it about this friend of mine that was always bragging about his romantic exploits that occured at the Jamestown Yacht Basin in my home town that is on creek that leads to the James river, so I would have to say the big muddy James River. We were all so jealous of him so I thought I would write this song in tribute of his great prowess. DishDiva : Here is an interesting question. . .harlygal Says: we really would like to know your shoe size? Bruce_Hornsby_Live : My shoe size is 12 and you know what they say about people with big feet.DishDiva : Joshua_PA Says: I have heard rumors that you are related to Huey Lewis. Is there any truth to this? Bruce_Hornsby_Live : Huey Lewis married my mother’s mother making him my grandfather. I call him Grandpa Lou Bob. DishDiva : Megehe Says: on your first album..some of the songs set a Navy scene..could you expand a little on why that is? DishDiva : Guest_Julie Says: Bruce, thanks for leading me to some great books…Lee Smith novels and Fortunate Son particularly…what are you reading these days? DishDiva : humboom Says: Bruce..Song C and D….in keys other than their titles. Is there a Song A and B? Bruce_Hornsby_Live : Rather than giving my instrumental pieces names like “Celtic Soltice” or “Winter Karmic Flood” I choose to sidestep the issue by naming them with letters. So there is A,B,C,D and maybe on the next record there will probably be E and maybe even F. DishDiva : nevcab1 Says: I’d like to know if Bruce plans to work with the other ones in the future..also, any new other ones cds on the horizon? Bruce_Hornsby_Live : Like I’ve said before, we’re playing New Year’s Eve and probably the day before in California. And we are planning a new CD that we will be working on. A live CD from the tour we just did. I just had a long conversation with Micky today about that. Bruce_Hornsby_Live : I’m part of a literature conference with Lee Smith. At Baylor University in Wako Texas. I’ll be appearing at a litterary conference with Lee Smith, who’s work I love. DishDiva : Bruce, thanks for visiting us here on MSN Live! Bruce_Hornsby_Live : I’ll do it again soon!! DishDiva : Thank you to Bruce Hornsby for being our guest tonight! The chat’s topic has changed to: ..where the stars come to chat on MSN.com! DishDiva : and thank you to the MSN Live Crew for a great event!